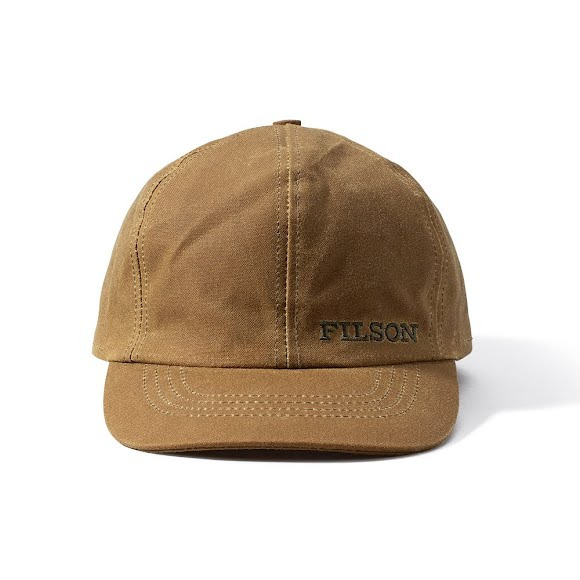 This classic Filson hunting cap has an insulated, poly-lined crown and tuck-away earflaps made with 100% virgin wool for breathable warmth in the field. The elastic band around the earflaps and neck flap ensures a comfortable fit even in adverse weather. Made with water-repellent, abrasion-resistant 15 oz Tin Cloth for years of use during open season and beyond. The most durable, abrasion and wind resistant cloth Filson makes. To create the Oil Finish, Filson&apos;s heavy, densely-woven cotton Tin Cloth is completely soaked in a paraffin-based wax. The highly water repellent finished fabric (15 oz. per yard), although very stiff at first, softens with use, gaining character over the years. Not designed for machine washing or dry cleaning. Clean by wiping or brushing only -- gains character with use. Hat Size 6 3/4"-6 7/8" 7"-7 1/8" 7 1/4"-7 3/8" 7 1/2"-7 5/8" 7 3/4"-7 7/8"
Head Circumference 21 1/8"-21 1/2" 21 7/8"-22 1/4" 22 5/8"-23" 23 1/2"-23 7/8" 23 7/8"-24 1/4"